Sure, this couple has been married for years, but Victoria Beckham’s engagement ring is well worth a look. Soccer star David Beckham proposed to “Posh” with a three-carat marquise-cut diamond, later upgrading Victoria’s ring to a jumbo-size pear shaped diamond that perches precariously on a diamond encrusted band. Like Victoria Beckham’s engagement ring, this example from Brilliance features a magnificent pear-cut diamond. A halo provides the illusion that the center diamond is much larger than it actually is, increasing the amount of sparkle by miles! Additional diamonds dazzle on the band, accentuating the center stone beautifully. Born April 17th of 1974, Victoria Beckham is an English fashion designer, businesswoman, model, and singer. She rose to fame in the late 1990s as part of the pop group Spice Girls and was dubbed Posh Spice by British music magazine Top of the Pops. She had four UK Top 10 singles after the Spice Girls split up, with her firs release, “Out of Your Mind” reaching number two in the UK Singles Chart. Over the past decade, Beckham has shot five documentaries, but that’s not all! Victoria has gained recognition as a fashion designer and style icon, lauching her own labels in 2008 and 2011. She has a significant celebrity following and tickets to her show are among the most coveted during the bi-annual New York Fashion Week. Did you know that Victoria Beckham has owned 13 different engagement rings worth an estimated four million pounds over the course of her marriage to soccer star David? Besides engagement rings and fashion rings containing diamonds, the pop star loves bands with emeralds and sapphires. David Beckham first proposed to Victoria in 1998 with a whopping marquise solitaire set on a yellow gold band. It cost an estimated 65 thousand pounds. Her ginormous pear-shaped diamond engagement ring was worth an estimated £159,000 back in 2005, and is worth even more today. Another of her favorites is a square-cut emerald surrounded by diamonds that is valued at more than half a million pounds. And, in case this weren’t quite posh enough, a heart-shaped diamond she wears occasionally is worth more than £1million. What Our Experts Have to Say about Victoria Beckham’s Engagement Ring. Victoria Beckahm’s engagement ring really is one in a million. The pear-shaped diamond it contains is perfectly cut, elongating Posh’s finger and accentuating her already glam appearance. Victoria’s style is adventurous, just like her personality, so it’s not at all surprising that she rarely opts for styles others seem to favor most. 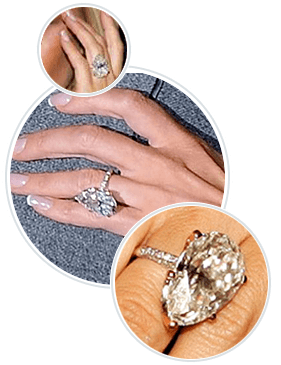 Celebrity engagement rings like Victoria Beckham’s may very well be out of your league, but there’s no reason to feel miserable! Thanks to Brilliance, beautiful diamond engagement rings are affordable, and it is possible to use our simple online tool to create stunning custom looks of your own, whether you are in the market for an engagement ring or a ring that’s more of a fashion accessory a la Victoria. Try our online tools out for size or chat with a friendly diamond expert free of charge. With Brilliance by your side, you’ll find life is more glamorous – and love is even more beautiful.